View More In Table Skirts. With these colorful grass table skirts your Hawaiian Luau themed party will be complete! These decorations measure 9ft x 29in and should fit most tables. MAKE IT FEEL LIKE A PARTY IN HAWAII - Green string table skirt also features a row of colorful silk faux flowers. SUPER SOFT YET DURABLE - Made of polyester and faux flowers made of silk. 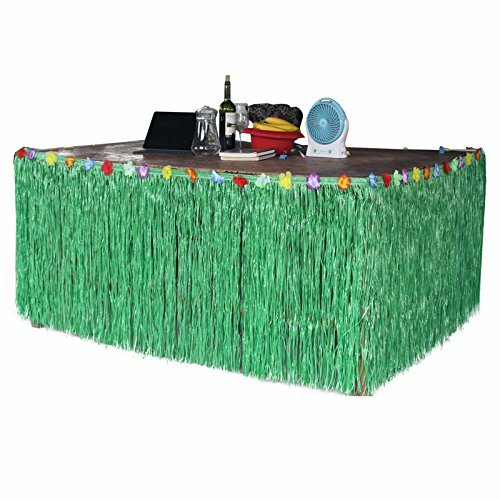 TROPICAL ISLAND DECORATION - Give your party that tropical look with this 9 ft table skirt. DRESS UP YOUR TABLE - Finish off your beach party decorations with this hibiscus Green table skirt. Spreads 9 ft out and hangs 29" inches low. PERFECT FOR LUAUS - Pool parties, barbecues, and more. If you have any questions about this product by Sc0nni, contact us by completing and submitting the form below. If you are looking for a specif part number, please include it with your message. LA Linen SkirtBurlap14x29-10Lclips-GreenHunter Burlap Table Skirt with 10 L-Clips44; Hunter Green - 14 ft. x 29 in. LA Linen SkirtBurlap14x29-10Lclips-BlueRoyal Burlap Table Skirt with 10 L-Clips44; Royal Blue - 14 ft. x 29 in. LA Linen SkirtBurlap17x29-10Lclips-GreenHunter Burlap Table Skirt with 10 L-Clips44; Hunter Green - 17 ft. x 29 in.